^^^Doesnt really make sense though. How does he propose a major electrical fire would kill all communication, transponders and ACARs in one fell swoop, so quickly that the pilot couldnt get a mayday out...and that too how would such a major fire leave the autopilot magically untouched to be able to fly for another 6 hours? Not to mention the fire would probably compromise the structural integrity of the whole aircraft in some way that makes a continued flight till fuel exhaustion very unlikely. There is also accumulating evidence that points to the course changes being inputted through the autopilot and not manually (as an emergency would definitely entail). Could be a cyber-jacking of the autopilot. He is right though that we shouldnt come to premature conclusions regarding the integrity of the pilots. But I do suspect foul play somewhere, especially given the fact the very low odds of a radar-evading flight pattern happening by chance (looking at the RTAF statements concerning their long range radars in the area). I do agree that this flight heading out into the indian ocean is where the search should only focus on...and it was stupid that a whole week was lost looking for it in the wrong place. Someone in the Malaysian transport safety bureau severely screwed up given that a lot of the evidence and data was available in a matter of hours and days. There is nothing wrong with getting assistance from other countries and organisations like the NTSB when time is of the essence! I can buy into the entire argument except the lack of communication. They had back up radios, even the battery operated hand held ones. Australia has just announced it has sighted some debris. Maybe we will soon have some closure for the relatives and some answers about what exactly happened. If there is a security exploit regarding the inflight entertainment system and autopilot, this has to be addressed urgently. Retired Air Force General Thomas McInerney isn’t backing away from his thriller novel-like suggestion that the missing Malaysian Airlines flight could have very well landed in Pakistan — and he says his theory is based on more than mere conjecture. “General, I’ve known you a long time, I know you too well to know that you’re not just making this up, this is not something you’ve concocted. You’ve spoken to a number of people, am I correct?” Sean Hannity asked McInerney during Tuesday night’s episode of “Hannity” on Fox News. “Yes, but that’s all I want to say, Sean, please,” McInerney responded. McInerney said that while he has reason to believe the plane landed in Pakistan, he has no idea about the fate of the passengers. “I don’t know anything about their status,” he said. McInerney pointed to the way the U.S. and Israeli militaries have acted in recent days to suggest that much more is known about the missing flight than has so far been revealed. The mystery actually deepens, considering that the CVR and FDR too could have been manually shut down before the turn, like the silk air pilot did. Also, why did they fly past Langawi if they missed when they could have turned towards KL? Such a large curve towards Australia, did they lose hydraulics and were turning using engine power? Edited by Felicius, 20 March 2014 - 09:06 AM. Rupert Murdc0ck and FOX are adamant on highlighting Pakistan, this tabloid and third-rate journalism should be taken care of. CANBERRA: Surveillance aircraft scoured a remote and stormy section of the Indian Ocean on Thursday for a pair of floating objects that Australia and Malaysia guardedly called a “credible” lead in the 12-day-old hunt for a missing passenger jet. Australia said the objects – one was estimated at 24 metres (79 feet) across – were captured in satellite imagery, raising hopes of a breakthrough in the Malaysian plane's mysterious disappearance as relatives of the 239 people aboard braced for another emotional roller-coaster. Four search aircraft were dispatched from Australia – which has taken charge of the search in the southern Indian Ocean – to the area about 2,500 kilometres (1,553 miles) southwest of Perth where the grainy images were snapped. The planes – two from Australia, one from New Zealand and one US aircraft – covered an area of 23,000 sq km (9,200 sq miles) without any sighting before the search was suspended for the day, said the Australian Maritime Safety Authority (AMSA). It earlier reported cloudy, rainy conditions and limited visibility. A Norwegian merchant ship reached the site as daylight waned, and another merchant ship was en route. The Australian navy's HMAS Success was also headed for the area, and Britain sent a naval survey ship, HMS Echo. Clearly wary of raising hopes following a series of past false leads, Hishammuddin warned of delays in verifying the apparent debris. Investigators believe it was deliberately diverted but still don't know by whom, why, or where it ended up. 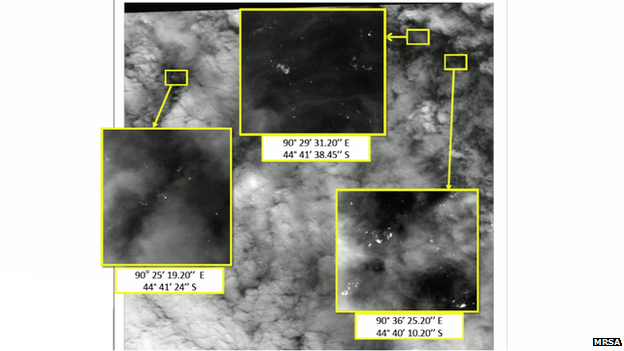 The satellite images, taken on Sunday, were first revealed earlier in the day by Australian Prime Minister Tony Abbott. The larger of the two was described as measuring 24 metres. Abbott told parliament the images represented “new and credible information” but stressed that any link with flight MH370 had still to be confirmed. “The indication to me is of objects that are of a reasonable size and probably awash with water and bobbing up and down over the surface,” top AMSA official John Young said. The images are the first solid clue since the search area was significantly broadened last weekend to take in a vast part of the Indian Ocean. Experts said the fact that Abbott himself had released the information lent weight to its credibility, but warned it could be difficult to find the objects in an isolated corner of the Earth noted for strong currents. “The current there is one of the strongest in the world, moving at as fast as one metre per second,” said Gan Jianping, an oceanographer at the Hong Kong University of Science and Technology. HMAS Success, which is capable of retrieving any debris, is some days away from the site. The objects would have drifted for four days, making them a “logistical nightmare” to locate, said Australian Defence Minister David Johnston. “We are in a most isolated part of the world. In fact it probably doesn't get, if I can be so bold, more isolated,” Johnston told Sky News Australia. He was later quoted as saying it could take “two or three days” before any firm conclusions are made. Now seriously i am praying that this plane better off destroyed than found in Pakistan. Take out all the international airports and the military bases, how many runways do we have that can accommodate a 777? This is what the inbreds can't grasp, either that or they are implying that this is state sponsored. They are wasting days searching around Perth, but not Maldives where 5 people have confirmed that they saw a low flying aircraft with red stripes similar to the 777. Military radar tracking shows that the aircraft changed altitude after making a sharp turn over the South China Sea as it headed toward the Strait of Malacca, a source close to the investigation into the missing flight told CNN. The plane flew as low as 12,000 feet at some point before it disappeared from radar, according to the source. Everything is wrong here, we were given wrong stats to begin with. The aircraft started with 7.5 hours of fuel (this is what all of us were told). The 777 will consume about 10-20 minutes of fuel on just the taxi and takeoff depending on the weather temperature and how heavy they are; 237 passengers, plus crew, plus luggage, they were heavy for sure. Temperature at equator is always hot. We know they flew for 1 hr 40 mins before the turn. 15-20 minutes at take off - about 2 hours of fuel is consumed. They had 5.5 hours of fuel remaining at that point of turn. Then they dived down to 12000 feet, burning extra fuel (having now 3.5 - 4.5 hours of fuel). How did they even reach 4 hours beyond Perth? Today they are confirming that the last ping was near Perth, so whoever (US / Australia) was monitoring it let other nations continue their search in the South China Sea and waste valuable time and their resources, if there were any survivors ensuring it that they do not live to tell the story. Edited by Felicius, 24 March 2014 - 08:40 AM. Well RIP to all those unfortunate souls. I hope their deaths will not be in vain and this mystery will eventually be solved. Krad that is the thing, we all feared that the jet had crashed. Why did it take them so long to make it official? We may find out what happened inside the cockpit at some point, but we'll never find out what really happened. They can't alter or delete the data on it. Edited by Felicius, 24 March 2014 - 09:05 PM. It could be a possible hijacking where the pilot deliberately took the aircraft to the desolate vast expanse of the ocean in order to avoid populated areas from being targeted! A further 122 objects potentially from the missing Malaysian plane have been identified by satellite, the country's acting transport minister has said. The images, taken on 23 March, showed objects up to 23m (75ft) in length, Hishammuddin Hussein said. All aircraft taking part in Wednesday's search have now left the area without identifying debris from the plane. Flight MH370 from Kuala Lumpur to Beijing disappeared on 8 March with 239 people on board. The objects were found in satellite images from a 400 sq km area around 2,557km (1588 miles) from Perth in Western Australia, Mr Hishammuddin said. He said that it was not possible to tell whether the potential objects were from the missing aircraft, but called them "another new lead that will help direct the search operation". The images were supplied by French-based Airbus Defence and Space and were given to the Malaysian Remote Sensing Agency on 25 March, Mr Hishammuddin said. The images were passed on to the Australian Rescue and Co-ordination Centre in Perth on Tuesday, he added. The latest images are the fourth known collection of satellite pictures showing possible debris in the southern Indian Ocean. No pieces have yet been recovered in the search area, which has now been split into an east and west section. The hunt for missing Malaysia Airlines flight MH370 is now focused on a remote area of the Indian Ocean north west of Perth, Australia. International teams on board a number of planes and ships are scouring the area on a daily basis in the hope of identifying the wreckage of the jet. On Friday 4 April, the search moved into a new underwater phase as specialist equipment was dispatched to hunt for signals from the plane's black box flight recorders - devices that could provide clues to why the plane disappeared. Australian authorities, who are co-ordinating the operation, say they are continuing to refine the search area based on new satellite data analysis. The search area has changed in scope many times. At its largest, it covered 2.96 million sq miles (7.68 million sq km) - a total of 2.24 million square nautical miles. This was the equivalent of 11% of the Indian Ocean and 1.5% of the surface of the Earth. The initial hunt focused on two corridors - one stretching north between Thailand and Kazakhstan, the other south between Indonesia and the southern Indian Ocean. However from 16 March, satellite images of possible debris and tracking data released by the Malaysian authorities appeared to confirm that the plane crashed in the Indian Ocean, south west of Australia. After searching an area more than 2,000km south-west of Perth, the hunt switched more than 1,000km (600 miles) further north, based on further analysis of radar data which showed the plane was going faster, thus using more fuel. The latest search zones have been even further north - off the coast of Western Australia - and are outside the "roaring forties" bad weather zone, meaning conditions are likely to be better. However so far, not one piece of debris has been identified or recovered. Search crews are preparing to deploy underwater scanning equipment. Who is taking part in the search? Seven countries have been assisting - Australia, China, Japan, Malaysia, New Zealand, South Korea and the United States. The investigation is being led by the Malaysian authorities, who are also liaising with the FBI, Interpol and other international law enforcement agencies. However, Australia has set up a new Joint Agency Co-ordination Centre (Jacc) based in Perth to oversee day-to-day search operations. Members of China's Civil Aviation Administration and officials from the France's Office of Investigations and Analysis for the Safety of Civil Aviation have also joined the investigation. The French are hoping to lend expertise from the two-year search for the flight recorders from the Air France Airbus A330 which crashed into the Atlantic Ocean in 2009. British company Inmarsat along with the UK Air Accident Investigations Branch have provided detailed satellite data analysis to aid the hunt..
What key equipment is being used? Military aircraft have been tasked with scouring the area, with civilian aircraft acting as a communications relay. A number of ships are also in the region, attempting to locate possible debris spotted by satellite or plane. Two vessels - the Australian naval support ship Ocean Shield and the UK's HMS Echo are towing pinger locators - specialist listening equipment that can detect ultrasonic "pings" from the plane's "black box" flight recorders. The "towed pinger locator" (TPL) is pulled underwater behind a ship at slow speeds, and uses a hydrophone - a highly sensitive listening device. However the pingers only have power to last around 30 days, and time is now very much against search crews, with more than three weeks having passed since the flight disappeared. The depth of the water in the search area is estimated to be between 2,000m and 4,000m (6,560ft and 13,120ft). Aircraft types involved in the search include a US Navy P-8 Poseidon and Australian, New Zealand, South Korean and Japanese P-3 Orion maritime surveillance planes. Two Chinese Ilyushin Il-76s have also been operating out of RAAF Pearce air base near Perth. Malaysia has sent two C-130 Hercules aircraft. The Lockheed Martin P-3 Orion is equipped with radar and infrared sensors as well as observation posts to help detect any debris on the surface of the ocean. It also has three cameras beneath the landing gear capable of zooming in for a closer look. The four-engine turboprop plane is designed to fly low and slow to aid surveillance. Once it has reached the search location, one or two outer engines can be turned off to preserve fuel and extend the surveillance time. The plane is also fitted with a magnetic anomaly detector (MAD) - used for detecting submarines underwater. 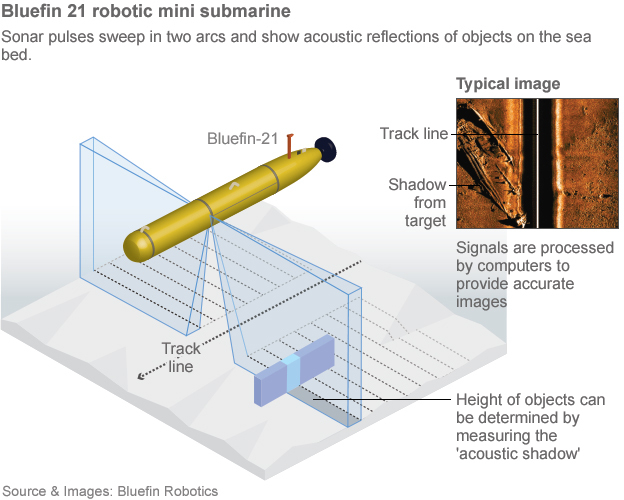 The aircraft also has acoustic detectors, which are able to detect sound 1,000ft (304.8m) below the surface of the ocean. Other ships in the area include HMAS Success, a naval oil tanker, equipped with a crane which could be used to recover any possible wreckage. China is assisting with a number of vessels, among them the ice-breaking Xue Long (Snow Dragon) research ship. The UK's HMS Tireless submarine, described as having "advanced underwater search capability", has also joined the team. The hunt for missing Malaysia Airlines flight MH370 moved into a new phase on Friday with the deployment of a towed pinger locator to find the black box. Two ships with locator capabilities are searching a 240km (150 mile) path in a bid to retrieve the data recorder. But Australia's search chief said it was a race against time as the battery-powered signal fades after 30 days. The plane disappeared on 8 March en route from Kuala Lumpur to Beijing. It was carrying 239 people. It is believed to have crashed in the southern Indian Ocean, although no confirmed debris has been found from the plane. The search is being co-ordinated from the city of Perth in Western Australia. Fourteen aircraft and 11 ships were involved in Friday's search activities. Ships sighted a number of objects in the area but none were associated with the missing plane, the coordination agency said. 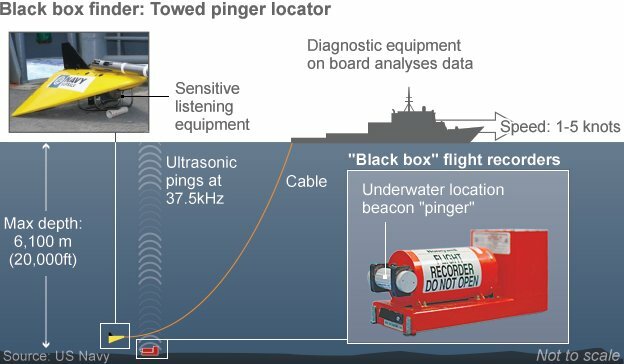 Angus Houston, head of the Joint Agencies Coordination Centre (JACC) leading the search, said that two ships had "commenced the sub-surface search for emissions from [the] black box pinger". Australia naval vessel Ocean Shield was using a towed pinger locator from the US Navy, while HMS Echo, which had similar capabilities, was also searching. But the former military chief now coordinating the eight-nation search said it was "getting pretty close to the time when it might expire." Beacons in the black box emit "pings" so they can be more easily found but the batteries only last for about a month. "The two ships will search a single 240km track converging on each other," Air Chief Marshal Houston, who is retired, said. ACM Houston said that the area had been picked on the basis of analysis of the satellite data. It was based on work regarding "how the aircraft might have performed and how it might have been flown", to choose the "area of highest probability as to where it might have entered the water". He pointed out that this data was continuing to be refined, but the current search was based on the "best data that is available". Given the progress in data evaluation and calculation, "there is some hope we will find the aircraft in the area we are searching", he added. The two ships will be moving at reduced speeds, of around three knots, in their attempt to detect any signal from the pinger. Commodore Peter Leavy, Commander of Joint Task Force 658, said that search operations generally preferred to use "physical evidence" and "drift modelling" to locate a plane. However, "no hard evidence has been found to date so we have made the decision to search a sub-surface area on which the analysis has predicted MH370 is likely to have flown," he said. In a statement, JACC said the focus was now on a search area of about 217,000 sq km (84,000 sq miles), 1,700 km (1,000 miles) north west of Perth. Meeting staff involved in the search on Friday, Australian Prime Minister Tony Abbott said: "It is probably the most difficult search that's ever been mounted." "A large aircraft seems like something that would be easy enough to locate - but a large aircraft that all but disappeared and disappeared into inaccessible oceans is an extraordinary, extraordinary challenge that you're faced with." ACM Houston said there was still a "great possibility of finding something on the surface [of the ocean]". "There's lots of things in aircraft that float," he said, citing previous searches where life jackets from planes were found. China's Xinhua News Agency says a Chinese ship searching for the missing Malaysia Airlines has detected a "pulse" signal. China's official news agency says a Chinese ship that is part of the multinational search effort looking for the missing Malaysia Airlines plane has detected a "pulse signal" in southern Indian Ocean waters. The report says a black box detector deployed by the vessel, Haixun 01, picked up a signal at 37.5Hz per second Saturday at around 25 degrees south latitude and 101 degrees east longitude. 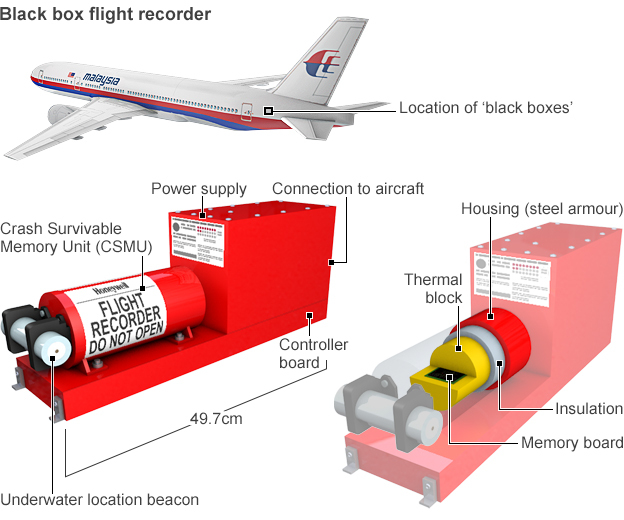 37.5 kHz per second is the international standard frequency for the underwater locator beacon on a plane's "black box." The report said it was not established whether that the signal was related to the missing jet. Edited by Felicius, 06 April 2014 - 12:23 PM. 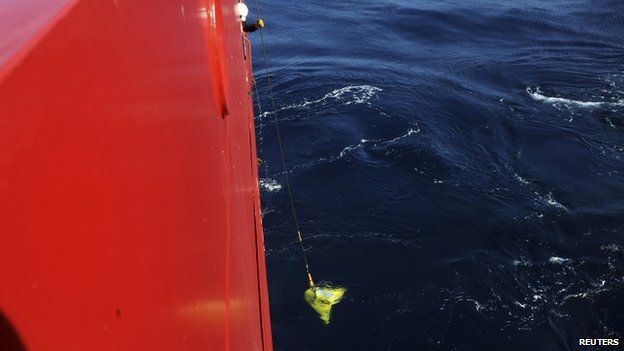 A British navy ship with sophisticated sound-locating equipment has joined a refocussed search effort to find out if signals picked up in the southern Indian Ocean are from MH370's black boxes. The Joint Agency Co-ordination Centre, at the centre of the search mission, announced at around 2am UK time that HMS Echo had arrived in the southern section of the search area to "assist" in the mission. Sky's Alistair Bunkall said HMS Echo would begin its search after carrying out preliminary environmental tests. 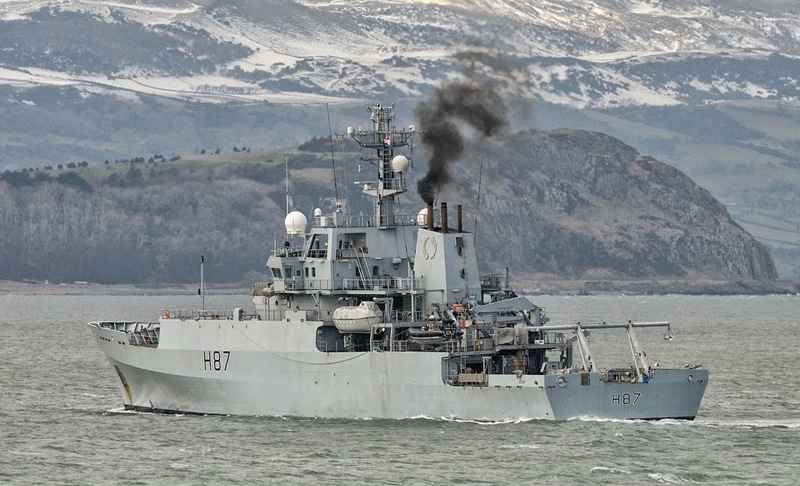 "Before she starts listening for the black box, HMS Echo must basically work out what other sounds are out there to calibrate her systems," he said. Hopes of finding the plane were boosted after Chinese ship Haixun 01 said it picked up a faint electronic pulsing signal on Friday, around 1,000 miles (1,600 km) northwest of Perth. A second signal was picked up by the vessel on Saturday, around 1.2 miles (2 km) away, lasting for around 90 seconds. Both signals had a "ping" of 37.5kHz frequency - the same emitted by the missing jet's black box recorders. On Sunday, Australian navy ship Ocean Shield detected a third signal in another area about 353 miles (555 km) away. Officials, however, have urged caution while they verify where the "pings" have come from. Searchers are anticipating good weather today, with 12 planes and a total of 14 ships expected to scour three locations totaling around 234,000 sq km. Sorry... all the Ping-Pongs prove to be false. .. the mystery continues. The international team searching for the missing jet are now considering whether the plane LANDED somewhere instead of crashing into the Indian Ocean. A complex underwater search involving a remote controlled mini-submarine is currently underway. But it has so far found nothing. Today, sources within the International Investigation Team admitted that the search may have to start again from scratch. Speaking to the New Straits Times, a source said: "We may have to regroup soon to look into this possibility if no positive results come back in the next few days." I thought the matter would have been cleared by now. The possibility of it landing at Diego Garcia AFB? Or Pakistanis hijacking it, and doing a complete re-paint job and inducting it into PIA colors? I hope this is one of those jokes. Right? They are spending around $21 million per day for the search efforts, going on for almost 50 days now. I doubt that it is a game to hide something; cover-ups are 1 or 2 countries, not a consortium - then it's not a secret if everyone knows. 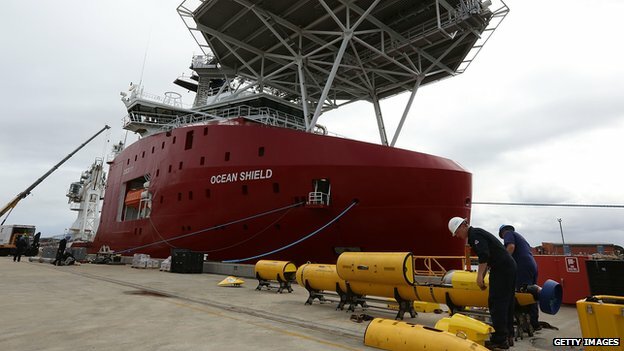 GeoResonance, an Australian marine exploration company, claimed it detected possible wreckage near the Bay of Bengal It has detected possible wreckage 5,000 km from the current search location. The Malaysian government confirmed Tuesday that officials investigating the disappearance of Malaysia Airlines Flight 370 were looking into an Australian company's claim to have located aircraft wreckage on the sea floor in the northern Bay of Bengal -- thousands of miles from the search area scanned meticulously for weeks to the south. Australian land and sea survey company GeoResonance said in a statement sent Tuesday to CBS News that it had discovered materials "believed to be the wreckage of a commercial airliner" about 100 miles south of Bangladesh in the Bay of Bengal using proprietary technology which scans vast areas for specific metals or minerals. The company's technology is often used to help clients find mineral deposits for mining, but GeoResonance also has participated in the hunt for old warships or aircraft on the ocean floor. "During the search for MH370, GeoResonance searched for chemical elements that make up a Boeing 777: aluminum, titanium, copper, steel alloys, jet fuel residue, and several other substances. The aim was to find a location where all those elements were present," said the company in the written statement. Scanning "multispectral images" taken from the air on March 10 -- two days after Flight 370 went missing -- GeoResonance says it found "an anomaly in one place in the Bay of Bengal" where many of those relevant materials were detected in significant amounts, and in a pattern which matched the approximate layout of a large aircraft. The company said analysis of images take of the same area five days earlier showed the "anomaly had appeared between the 5th and 10th of March 2014." In a statement released to the press on Tuesday, Malaysian Acting Minister of Transport Hishammuddin Hussein confirmed that his government was "working with its international partners to assess the credibility of this information." A U.S. official with knowledge of the investigation told CBS News on Tuesday that they were still in the early stages of gathering information about GeoResonance's claim, but they were "very skeptical" it would lead to anything, given all the data that investigators have been working with points to the southern Indian Ocean. A team of experts working for the International Investigation Team have been studying the data available on the flight, which includes the attempted communications between Flight 370 and satellites which led officials to focus their search in the so-called Southern Arc. They continue to analyze that data and their focus remains to the south, says CBS News transportation correspondent Jeff Pegues. British satellite company Inmarsat provided the relevant data to the Malaysian government -- a final seven "pings" recorded from the plane to the satellite. Based on those pings alone, two possible flight paths for the plane were charted from its last known location; one heading north toward the Bay of Bengal, and the other heading south into the Indian Ocean. On March 24, Malaysian Prime Minister Najib Razak announced that, based on new analysis of that data, Inmarsat and the lead investigators had "concluded that MH370 flew along the southern corridor, and that its last position was in the middle of the Indian Ocean, west of Perth." Reached Tuesday by CBS News, Inmarsat Vice President Chris McLaughlin said the decision to focus the search for the missing jet solely in the southern corridor was made by the Malaysian government and its search partners, not Inmarsat. McLaughlin noted that the data was scrutinized by experts from a variety of different countries, and "all agreed the aircraft came down in the southern Indian Ocean." One of the primary factors in that decision, according to McLaughlin, was the fact that not a single nation along the northern corridor -- which includes the Bangladeshi coast -- reported picking the plane up on domestic radar. When the decision to focus on the southern Indian Ocean was made, CBS News' Pegues reported that Inmarsat had also contributed one more piece of evidence which helped guide the move: the so-called Doppler effect. By measuring the sound waves from the plane's final pings, engineers from Inmarsat were able to determine the aircraft's location relative to the satellite; it's the same effect that makes an approaching vehicle sound different to the human ear than one moving away. The analysis of this data from Inmarsat suggested the plane had travelled south, reported Pegues. 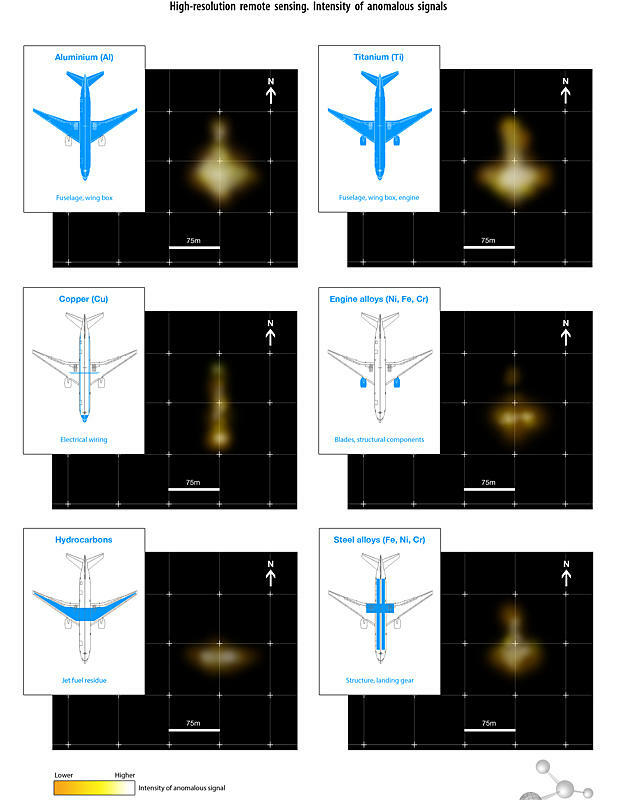 Inmarsat engineers compared Flight 370's direction and speed against six other Boeing 777s flying the same day in various directions. The findings were said to confirm the plane could not have gone north, and instead most likely crashed in the southern Indian Ocean. There have been many false leads in the hunt for the Malaysia Airlines Boeing 777-200 since it disappeared from commercial radar northeast of Manila on March 8. Investigators still believe the plane made an inexplicable about-face after losing contact, heading southwest into the Indian Ocean. Officials said Monday that with not a clue found to date, the huge search area about 1,000 miles southwest of Perth, Australia -- which has been combed fastidiously by a robotic U.S. Navy submarine using sonar imaging -- would be expanded significantly and the air search called off. 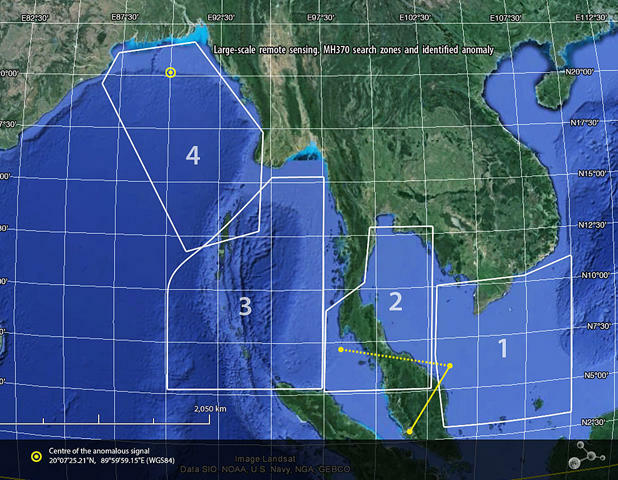 "It is highly unlikely at this stage that we will find any aircraft debris on the ocean surface. By this stage, 52 days into the search, most material would have become waterlogged and sunk," Australian Prime Minister Tony Abbott said Tuesday. "Therefore, we are moving from the current phase to a phase which is focused on searching the ocean floor over a much larger area," he said. That search, according to Abbott, could take at least eight months. GeoResonance said it first alerted officials with Malaysia Airlines, and the Chinese and Malaysian embassies in Australia, that possible aircraft debris had been found in the general area of its discovery on March 31, "well before the black box batteries had expired." "These details were also passed onto the Australian authorities (JACC) in Perth on April 4, 2014. A more detailed study was completed in early April. The final 23 page report including the precise location of the wreckage was passed onto Malaysian Airlines, Malaysian High Commission in Canberra, Chinese Embassy in Canberra, and the Australian authorities (JACC) on April 15, 2014," according to the company. It was not immediately clear whether the international search team has previously investigated GeoResonance's information. Edited by Felicius, 29 April 2014 - 03:39 PM.